Road traffic accident rates in Scotland have increased since new, tougher drink-drive limits were introduced in 2014, a study has shown. Researchers from Glasgow University said early public awareness campaigns had not been maintained. Writing in The Lancet, they said road accident rates in Scotland were now higher than those in England and Wales. The Scottish government said most levers to tackle drink-driving were retained by Westminster. Holyrood was able to introduce lower limits on blood-alcohol content (BAC) for drivers in December 2014 after those powers were devolved. The limit became 22 micrograms of alcohol per 100 millilitres of breath. Previously it was 35, a limit still in force in England and Wales. The researchers - whose study measured rates of all road traffic accidents, not just those which were alcohol-related - said this reduction did not have the intended effect of reducing road traffic accidents (RTAs). They said: "This reduction in the BAC limit for drivers decreased alcohol consumption from on-trade alcohol sales (eg, in bars and restaurants) by less than 1%, but did not affect alcohol consumption from off-trade sales (eg, from supermarkets and convenience stores), which account for approximately three-quarters of total sales." Prof Jim Lewsey of Glasgow University's Institute of Health and Wellbeing, who led the study, said: "Our negative findings for road traffic accidents are unexpected given that previous evidence generally demonstrates a reduction in accidents after reducing blood alcohol limits for drivers. "The most plausible explanation of our finding is that the new blood alcohol limit was insufficiently enforced, publicised, or both." He said to enforce drink-drive legislation properly required frequent and systematic random breath testing, public education, publicity, and awareness campaigns. The study suggested people who ignored the previous blood alcohol limit may be continuing to ignore the new limit, especially if they think their risk of being caught has not changed. It pointed out that after the reduced BAC limit was introduced there was substantial investment by the Scottish government in materials and campaigns to build public awareness of the change. But it says this was not maintained in 2015 and 2016. The charity Alcohol Focus Scotland (AFS) called for more to be done to raise awareness of the dangers of drinking and driving, and better enforcement to increase the chances of offenders being caught, including the introduction of random breath testing. Alison Douglas, AFS chief executive, said: "Reducing the drink drive limit was the right thing to do as the risk of having an accident rises in direct relation to the amount of alcohol consumed. "The safest thing to do is avoid alcohol completely before driving. We need to increase public understanding and awareness of the risks and the limit." The Scottish government said it has consistently run the "Best Approach is None" social marketing campaign to support Police Scotland's summer and festive enforcement campaigns. But it pointed out only powers to set the blood/alcohol limit had been devolved. 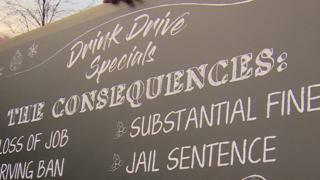 Powers over other drink-driving laws such as changes to penalties to deal with drink driving or the introduction of random breath-testing are reserved to Westminster. A spokesman said: "The Scottish Parliament agreed unanimously to set the drink-drive limit based on the scientific evidence as to when impairment begins to increase significantly - bringing Scotland in line with most European nations. "Scotland's roads are becoming considerably safer and we have seen a long-term trend of significantly reduced numbers of accidents, even as traffic volume has increased. "We agree - and have always been clear - that the law alone cannot tackle the issue of irresponsible drinking." Police Scotland said it had supported the legislation which brought Scotland in line with many European countries. "What is clear from the analyses of road traffic collisions in Scotland is the life-taking impact of the so-called 'fatal four' causation factors: Inappropriate speed, not wearing a seatbelt, driver distracted by using a mobile device, and driving whilst under the influence of drink/drugs," said Ch Supt Stewart Carle, head of road policing. "Our message is clear - there is no safe limit for drink driving, so don't risk it."